Bicycle Bill Rides Again! : Read Any Good Books Lately? You might have the impression that riding a bike is a hobby for me. You might be right. My kids will probably tell you that when I decide to engage in a new hobby, I get very involved in it and try to learn everything I can about it. I did the same thing with golf; I read instruction books, I practiced, and I subscribed to publications such as "Golf" and "Golf Digest". I've done the same thing with a couple of other hobbies, such as shooting and locksmithing. Huh. Some of you learned something new about me! It has been a really good week commuting to work. The weather has warmed up, and I only rode in the rain a couple of times, and it really was not much rain while I was riding. I increased my commuting distance a little each day, and this morning I rode about 10 miles by riding out Main Street towards Palmer. Rhonda and I ride to Palmer often in the evenings when the weather is warm. I was a little disappointed this morning with how much the road has washed out, but I also acknowledge that it has been a cold and wet winter! Sorry, I digressed from the topic. Back to the books! 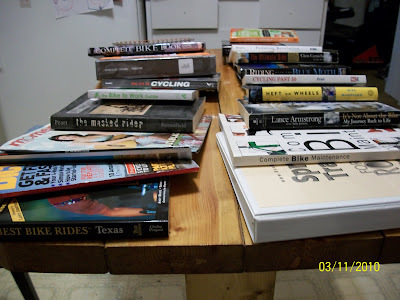 The pictures show my library of books about cycling. There are books on bicycle maintenance, bicycle rider conditioning, bicycle tours, bicycle commuting, and personal experiences of other cyclists. I think it is interesting that two of the books call themselves the "complete" books. At least one of them must have been "incomplete". Of course, no cyclist would have a library without at least one book by Lance Armstrong. 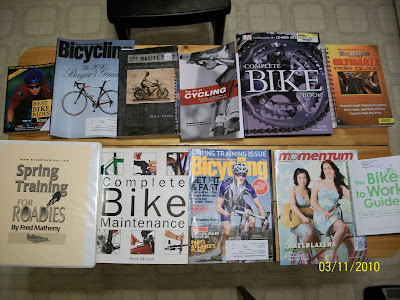 I could write a review of each book for you, but I'd rather just let you read what interest you and decide for yourself without my influence, but if you have a question about one, sent me an email bicycle.bill@att.net and I'll get back to you. I promise! 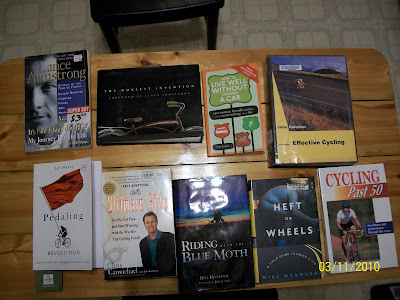 Check your local library for books about cycling, or let me know and I'll be glad to loan you any of mine. There is also a wealth of knowledge about cycling on the Internet. Maybe in my next post I'll include a list of some of the web pages that I read. Excellent suggestion PM. Cyclecraft (North America) is a well written, general guide. I have both the UK and US versions. I would also add two other John S. Allen books: Street Smarts: Riding Confidently, Legally, and Safely. Booklet (<50 pages) has been adopted by six states as defacto bike driver manual. I also really like The Complete Book of Bicycle Commuting (1981), slightly dated by again some interesting concepts about working with traffic. Finally, since you live Texas I would highly recommend Bicycling and the Law: Your Rights as a Cyclist by Bob Mionske, JD (2007). I understand in Ennis County they throw some cyclist in jail for using the road.